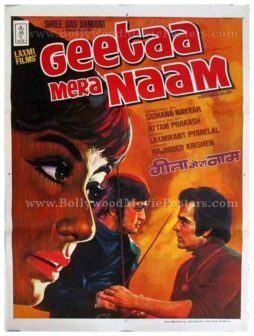 Highly collectible, hand painted vintage Bollywood poster of the hit Hindi film Geeta Mera Naam (1974) for sale. 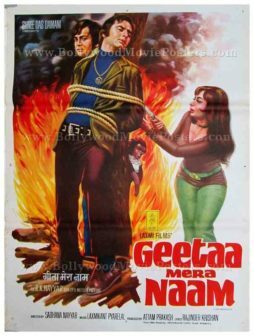 This is an actual surviving vintage poster of the 1974 film that featured Feroz Khan & Sunil Dutt in lead roles. Printed and circulated during the release of the film, this hand painted vintage Bollywood poster was originally designed for publicity of the film but never ended up being used. 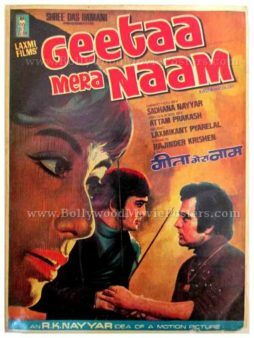 The anti-hero Sunil Dutt is seen in blue at the center of the poster, whereas the lead protagonist Feroz Khan appears on the top in a large close up portrait. Bollywood movie poster designers at the time often used certain shades of colors to depict the emotion or character behind the roles essayed by the actors. Blue was the color of choice to depict villains or negative energy as was green. Scandalous for the time, the actress of the film is seen holding on to a glass of whiskey in a somewhat promiscuous pose. 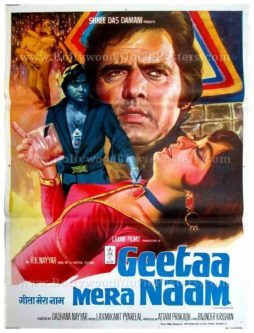 Very few hand drawn vintage Bollywood movie posters featured women drinking alcohol (a taboo at the time), making this rare gem a highly collectible piece.